Sun shines down on 3,000 visitors at Holker Spring Fair! Visitors to Holker’s 2nd Spring Fair enjoyed glorious weather last weekend, with 3,000 people attending across the two day event. With a variety of exhibitors covering all things food, home, gardening and craft, and entertainment including The Fairly Famous Family theatre performers with their Kitsch Café and the visiting Why Not Alpacas—a great weekend of fun was had by all! 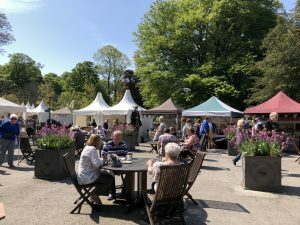 Jillian Rouse, Head of Visitor services at Holker Hall & Gardens was delighted with the turnout, “We’ve had a wonderful weekend and the weather really couldn’t have been better. Wonderful feedback from our exhibitors, and visitors really enjoyed the entertainment, plus our Holker Scone Bar went down very well! Great to see so many dogs joining in on the event too, with plenty of families bringing them along. We look forward to planning the third Spring Fair in 2019!”.